(TriceEdneyWire.com) - John E. DeFreitas began driving a taxicab when he was in college 40 years ago. The self-described ‘transportation specialist’ said he has watched what is now the longest federal government shutdown in U. S. history unfold and swallow up the lives of significant numbers of people. While the focus of the media has centered primarily on the 800,000 federal employees who are currently sidelined without their paychecks because of the squabble over a wall on the southern border, the residual effects are being felt among people far removed from the federal government. DeFreitas said doormen’s hours have been cut back, others have been sidelined temporarily until business picks back up, and the numbers of maids, servers and cooks in restaurants in the Washington metropolitan area is being reduced or increased depending on demand. Fela Sekou Turner, a celebrity hairstylist in the District of Columbia, located in the heart of the nation’s capital, caters to clientele who work for federal and DC governments. He said the ripple effects are being felt and seen at his spot. By ‘this’, Turner means a partial shutdown of 11 federal agencies initiated by President Donald Trump on Dec 22. He made that move because he’s upset Congressional Democratic leaders have refused to agree to give him $5.7 billion for a wall to be constructed on America’s southern border – the wall that he repeatedly, during his campaign, said that Mexico would pay for. For months, Trump has issued warnings about the influx of thousands of Central and Latin American migrants who he has wrongly branded murderers, drug dealers and terrorists. The wall, he contends – despite evidence to the contrary – will keep out tens of thousands of Central and Latin American migrants from entering the country. The president has threatened to declare a national security emergency though none exists. He is using hyperbole and misleading statements about the criminality of brown-skinned immigrants to bolster his case even though statistics show that immigrants commit less crimes than natural-born Americans. Contrary to his characterizations, most of the migrants are fleeing their countries in protection of their own lives and the lives of their children and families. Many are running from gangs, violence and economic privations in their countries of origin. Trump has stirred up fear among his base – majority White Americans. But House Speaker Nancy Pelosi (D-Calif.) and Senate Minority Leader Chuck Schumer (D-N.Y.) have refused to budge, accusing Trump of fearmongering and lying about the severity of the situation. Trump is promising to keep the federal government closed until Democrats accede to his demands, for years if necessary. As a consequence, the aforementioned 800,000 federal workers are sitting home. Approximately 420,000 people, deemed essential employees are working without pay and an additional 380,000 are on furlough forced to stay home without pay. Meanwhile, tens of thousands of federal government contractors – because they are subcontracted and are not full-time federal employees – are not being paid and may never receive back pay, according to the Associated Press and other reports. Fear, uncertainty and frustration is simmering as people try to figure out how to pay rent, mortgages, school fees, tuition and childcare, make car payments, determine what to cut back on, surmise what to eliminate and still take care of utilities and other facets of modern life that demand their money. A recent Business Insider story points out that affected federal workers have more than $400 million in mortgage and rent payments due this month which could cause turmoil in the US housing market. Yet, there’s no resolution or end in sight for a shutdown that on Saturday, Jan. 12 became the longest federal shutdown in U.S. history. Economic experts say if it lasts two more weeks, the cost to the economy will exceed the price of the wall. Diane Stevens, owner of the Cole Stevens Salon, and Clayton Lawson, an area barber, said the apprehension is palpable. Stevens’ company has 49 employees and two locations, one on Capitol Hill and the other in Greenbelt, Md. She said they are just beginning to feel the effects of the shutdown but she still expects a spike. Meanwhile, restaurants and an assortment of eateries have been offering affected workers free coffee, pizzas, burgers and other meals, according to published reports. 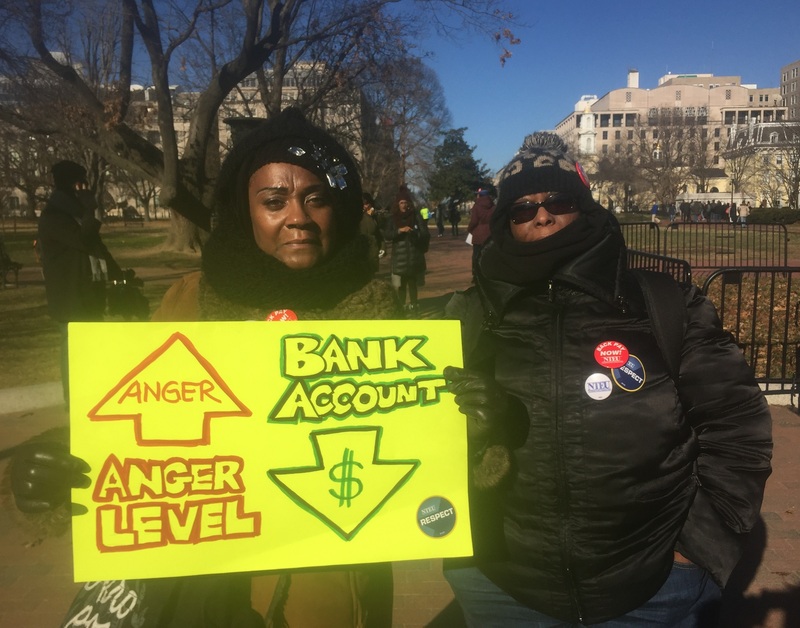 Churches in and around D.C. have appealed for contributions to their food banks to assist furloughed federal workers and others during the hard times. For example, world-famous Chef José Andrés is offering federal government employees free sandwiches until they get paid again. Meanwhile, other establishments are offering entrance into activities at community and fitness centers and private museums. Turner, a Pittsburgh native, says this outpouring of support he’s seeing from regular people is unprecedented.